I wanted to go on a solo trip somewhere for a long time and 1st week of April seemed like a good opportunity. But I had no idea where to go until last week of March. All I knew that the place should be mountainous and not crowded. McLeodganj seemed to be a good enough place and after thinking about it for a bit I chose it as my destination. Getting there from Delhi takes approximately 12 hours by road. I took a Volvo bus which was full of tourists from all over the world. It wasn’t very comfortable journey but I managed to doze through most of it. If you are short on time but still want to sample as many different varieties of food as possible in the shortest amount of time, then there is no place better than a food court. Fortunately, there are quite a few such places where you can have almost any kind of Indian food in clean surroundings at fairly decent prices. Some of the more famous ones are in Pragati Maidan, Dilli Haat, and Kingdom of Dreams. Additionally, there area few smaller courts in less famous places like Garden of Five Senses. A food court in general, will have small stalls serving food from all corners from India and sometimes foreign too. If for you a South Indian food place means a joint which serves the usual <em>idli, dosa, uttapam</em>, curd-rice kind of stuff, prepare to get surprised. You can find many more dishes from ALL of the south-Indian states which includes Kerala, Tamilnadu, Karnatka, and Andhra Pradesh, each with it’s own stall. Even the staff belongs to that particular state for that extra authentic touch. Quality of the food might differ from one place to another even in the same premises. For example, a particular state’s stall in INA Dilli Haat may serve some really good food, while it may be not that good in Pitampura Dilli Haat. That was just a general example, but we hope that you catch the drift. Of course, food is not the only reason to visit these places as these are some of the must visit places in city. Dilli Haats for example have handicrafts, traditional clothes, furniture and other knick-knacks from all over India for sale all the year round. In addition a lot of cultural events like music shows, conventions etc. are held there all the year round. Similarly, Garden Of Five Senses has some really beautiful and interesting flora, fauna and artistic concepts. Pragati Maidan with an approximate area of 72,000 sq m is one of the largest exhibition grounds in world. It’s a favoured venue for numerous events ranging from expositions by all kinds of industries to trade, book fairs etc. Quite often, on occasion of some popular event like International Trade Fair, Auto Expo etc, authorities are forced to limit the number of visitors in order to maintain law and order. To cater to demands of so many visitors, Pragati Maidan has quite a few eateries spread all over the area. If you aren’t in mood to eat in any of the restaurants inside premises, you can still have quite decent street food in any food court. 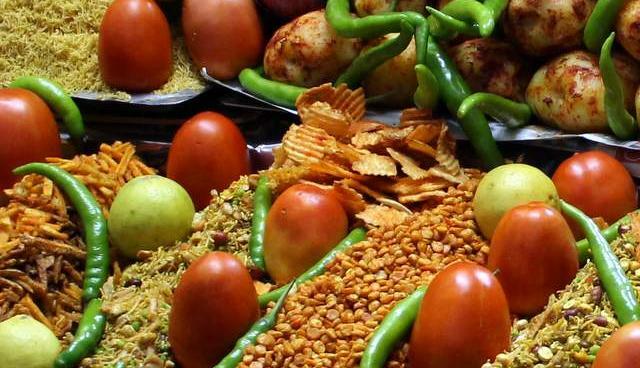 Apart from the usual snacks, one can find popular food from almost all corners from India. Gatta roti from Rajasthan, Hyderabadi biryani, Pao Bhaji & Bhel Puri from Maharashtra, most of South Indian dishes, these and many more are available in their authentic flavour. Although in some case the prices are slightly higher, it’s offset by the sheer variety of food available in such a small area. Another plus point is decent indoor seating facility which is often missed in other places. Next time you are in Delhi, be sure of including Pragati Maidan or any other food court in your must see places . Even if you don’t like the event being held, it’s quite likely that you’ll like the food.